Having worked with KPMG many times over the years it’s always a pleasure to hear from them. In the past we’ve created cake making networking and client events for them. This was more of an intimate company event as it was really an opportunity for this department to have fun and do some team bonding. The serious surroundings of the boardroom did nothing to get in the way of the fun and games of the cake decorating activity. The cake making workshop got off to a cracking start with all attendees concentrating deeply on my cake decorating demonstration. 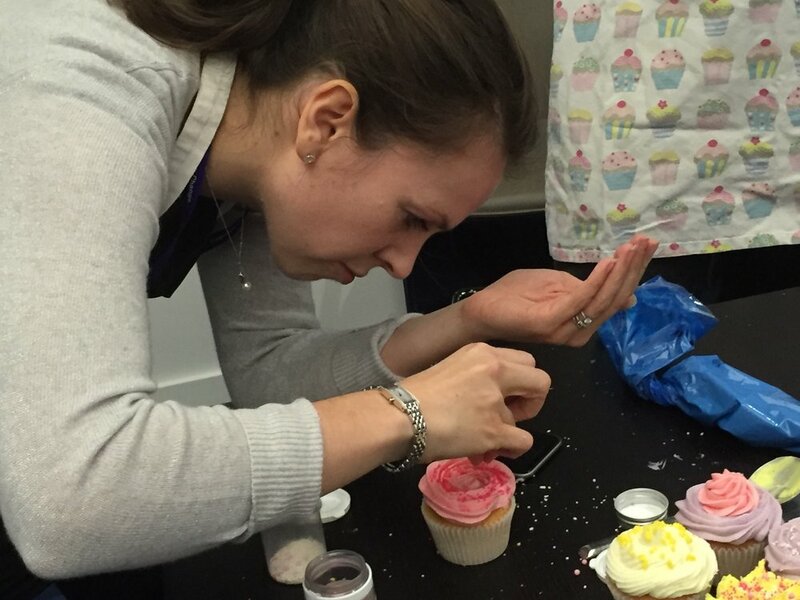 A certain amount of friendly competition arose once we got to the ‘speed cupcake decorating element’ although I am pleased to say that on this occasion there wasn’t any sabotage involved! At the end of the 2hr session all the participants were thrilled with their beautiful creations and took them home to share with their friends and family. Although the KPMG headquarters are pretty much as far away from our HQ as it’s possible to be whilst still in London, it was well worth the visit. Apart from getting the opportunity to meet a lovely group of people and teach them some cake making skills, I felt very privileged to have these stunning views across the docklands as our backdrop.